PCs and laptops may no longer sell as it was before, but that does not mean there is no room for innovation and surprises in this segment. As it has been proven once more by HP, which actually has bet very strong with a laptop that takes that format to the next level. The new HP Spectre on paper is exceptional. It seems that the farm had read the reviews of the MacBook that Apple introduced a few months ago and had solved point by point all those faults, because as you will see below, the worlds thinnest in its category shows spectacular elegance on all four sides and is ready to shake the computer industry. 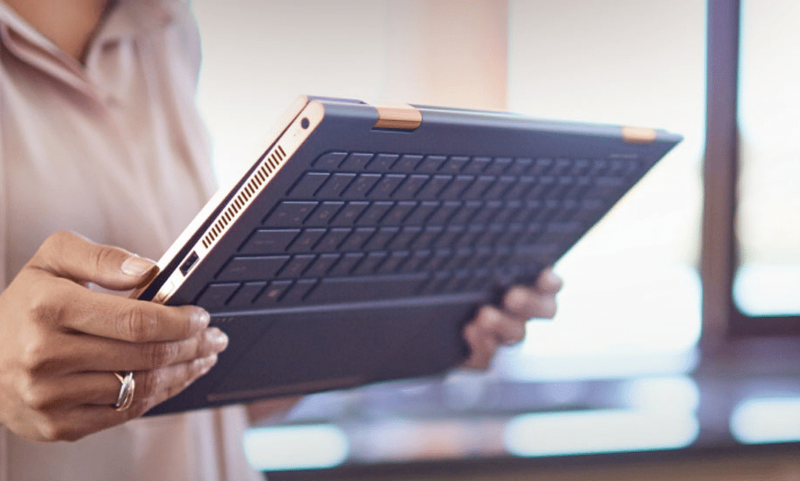 The new HP Premium range debuts with a design very different from what we knew. For starters, changed the logo, which lets guess those same lowercase letters ( “hp”) but does so without closing strokes. That’s just a detail of a design that first stands out for its thinness: we are against a team that has a thickness of only 10.4 mm. Until not long ago, that figure would be more suitable for a tablet, but here HP has achieved a remarkable milestone, especially if we consider its internal specifications. That design arrives with the use of aluminum and carbon fiber along the entire outside and inside. Aluminum actually is bathed in a golden color (or champagne), while the carbon fiber has a matte black color. The choice of materials and its internal components make the weight to 1.11 kg, slightly above the 920 grams of the MacBook with which to compare it is inevitable. HP commented makers as one of the elements most important design team has been its hinge “piston”, which in this model has been applied a mechanism to “retract” when we open and close the laptop. That is crucial for the ultra thin design, and the internal mechanism revealed in HP which was really interesting. HP did not want to miss the opportunity to bring to market accessories that accompany this Spectre in that design language. The first to appear will be a Bluetooth mouse and a carrying bag. Besides that HP has wanted to collaborate with renowned designers (Tord Boontje and Jess Hannah) to offer models in which both the housing and interior have striking motifs that always play with the gold (in fact, these details are gold plated 18k) and black. In addition, there are internal elements with Swarovski crystals and one of the models in the HP logo is embedded with diamonds. Both models will be auctioned at the Cannes Film Festival in May and the proceeds will go to the Nelson Mandela Foundation. Bites the dust, MacBook It may have been its intention, or may not, but the HP Spectre seems destined to leave Apple MacBook in a very bad place. Not only in design, where the thinness is enviable, but especially in the internal specifications. That thickness does not limit the power of the equipment, and we have a high-flying ultra portable. For starters we have the Intel Core i5-6200U (dual-core, 2.3 GHz) or Intel Core i7-6500U (dual-core, 2.5 GHz), somewhat surprising considering that thickness which would have to think about Core m.
However, HP have managed to integrate these processors through a new cooling system. They have devised a kind of hyperbaric chamber that allows use outside air, cooler and cool the processors and get that heated air by the ingenious ventilation system which is bound to question very silent equipment. Those processors accompany them with up to 8 GB of RAM and up to 512GB of storage along PCI SSD drives. The battery, which is not known moment capacity, consists of four cells precisely adapted to the shape of laptop to take every available space inside the machine. Another key element of this team is its 13.3 – inch IPS screen up to 300 nits and 72% of the gamut. HP has made a decision that we like: they have opted for a 1080p panel instead of going to one 1440p. That has allowed them to have a screen of only 2 mm (the aluminum chassis and the screen is added the Gorilla Glass 4 Glass 0.4 mm) that had been thicker have chosen a QHD panel. A more prominent note: a screen that has no touch support and that shows that this is a pure laptop but, of course, very evolved. That, of course, also has had an impact on said battery. With this resolution HP claim that the team reaches 9 hours and 45 minutes of battery life, a figure that will have to check but it certainly is promising considering these dimensions. The power adapter, incidentally, has a really small dimension, which is appreciated when transporting equipment from one side to another. In these specifications it is also important to mention the inclusion of two speakers Bang & Olufsen with HP Audio Boost technology, but especially the presence of not one , not two, but three USB-C connectors that serve both to carry equipment (support fast charging) as to support Thunderbolt 3 (two of them are dedicated to that interface) and USB 3.0. The keyboard is also another sign that the thing promises despite the thinness of the team we have keys with a distance of 1.3 mm , and as HP have invested much time studying and integrate a mechanism that allows after pressing the key to regain its position cleanly, quickly and accurately. The touchpad with glass surface has a small ridge and although they have not specified the size seems to have a remarkable size. All of these elements is necessary to add 802.11ac WiFi connectivity that will work both in the band 2.4 GHz and the 5 GHz. In HP we have confirmed that no adapters to integrate USB-A connectors traditional – a pity it would have been a detail-, which force you to buy accessories such externally. The team will be run by Windows 10, and HP indicate that the system image integrated into this team has been given particular attention to the times of startup and shutdown, as well as entry and recovery of the suspension are very small. The new HP Spectre will be available worldwide from May, and are priced from the $ 1169.99 with Core i5, 8GB of RAM and 256GB SSD, and that some of the 1,249 , $ 99 if we choose the model with Core i7, 8GB of RAM and 256GB SSD. 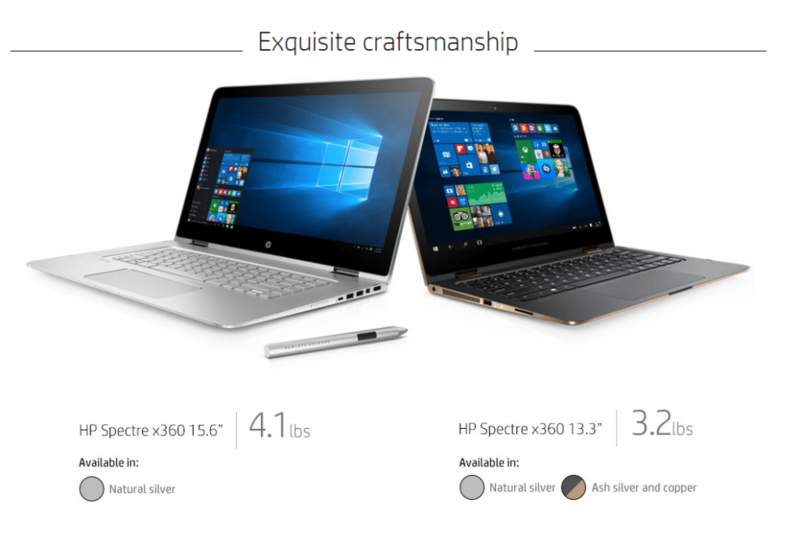 HP has indicated that the 13.3 – inch HP Spectre is expected to be available in Europe in June at a price of 1,499 € . Even taking into account taxes and the euro-dollar parity, it seems that we meet again disadvantaged in this regard, because that cost is certainly high when compared to the one in the United States.